Fuerteventura in the fabulous Canary Islands is the ideal spot to head for if you’re looking for a holiday break packed with things to do under a sun guaranteed to provide the goods all year round. This is the closest island in the group to the coast of Africa, just 100km from Morocco, and it basks in 3000 hours of annual sunshine, so you simply can’t go wrong here in terms of the weather. Mexico and Florida are on the same latitude, so basically expect an island paradise. In February the average temperature is a good 25 degrees Celsius and there’s very little rainfall, making for a slightly fresh but still gorgeously warm climate. With 150 fine sandy beaches and great cultural attractions to enjoy, Fuerteventura has something for everyone, and in February there’s more space and better prices too! Click here for current deals. 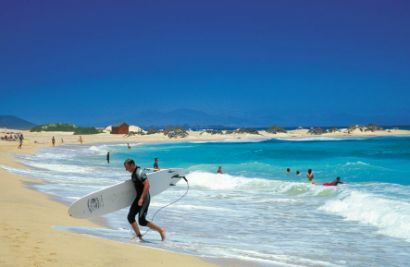 Fuertoventura is justly famed for its long golden beaches, especially on the Peninsula de Jandia, with the Costa Calma particularly popular with visitors. As temperatures are pretty good here even in February swimming is still very much an option. For some four-wheel drive excitement, go to the western coastline and a race across the expanses of deserted sand. Because of the great variety of marine life along this stretch, skin diving is a popular sport here, with loads of subtropical species to see. The Jandia Peninsula belonged to a German businessman during World War II and acquired a certain air of mystery which it still has, with rumours of submarines, spies, secret Nazi bases and hidden gold still flying around. This greatly expanded former fishing village is now one of the two main resorts on Fuerteventura, and the best place to come for entertainment in the evenings. The surrounding, protected sand dunes are the most attractive on the island, reminiscent of the Sahara and convenient for a stroll after lunch. There’s a lively port and several good fish restaurants, along with a regular ferry service to neighbouring Lanzarote for a spot of variety. Just offshore from Corralejo is the miniscule islet of Isla de Lobos, popular with surfers, sport fishers and scuba divers as well as snorkelers, and visitors can take cruises around the waters in glass-bottomed boats or land on the islet for swimming trips and barbecues. This charming village is actually built on the top of a volcano right in the middle of the island. It was the capital of the island’s 15th century ruler, Jean de Bethencourt, who chose this site to thwart the many pirates infesting the surrounding seas. Pop in to see the decorated beams, gilded altars and sacred relics of the Iglesia de Santa Maria, a real gem of a Spanish-style church, less intimidating than its bigger counterparts in Spain but just as atmospheric. The village’s only museum has some nice exhibits on the island’s history and a range of artefacts. When the first Europeans arrived here in the late 14th century they found a troglodyte race of tall, white natives living in the lava fields. They probably came in the 1st century BC from North Africa, and the Conquistadors made a point of exterminating them and their culture, but a few of their rather poignant surviving relics are on display here in the museum.